Will history be on West Coast’s side when they square off with either Hawthorn or Melbourne in the preliminary final at Optus Stadium next Saturday? The Eagles have triumphed in five of their seven preliminary final contests and boast a 100 per cent winning record when hosting a Grand Final qualifying fixture at home. West Coast's average winning margin is 26.2 points across its five preliminary final triumphs and when the club has gone down it has been by an average of 55.5 points. 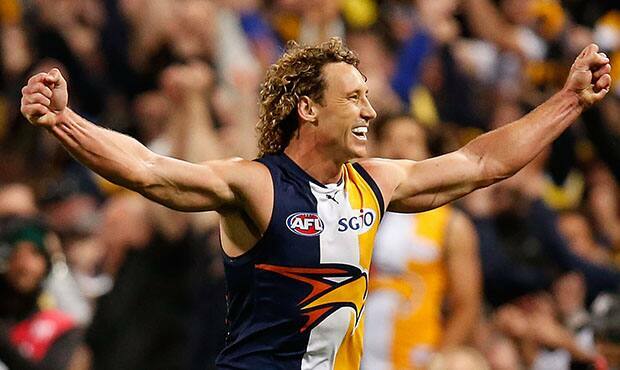 When playing at home, West Coast's has emerged victorious by an average of 35.3 points. It was a tough preliminary final initiation for the young Eagles. The ladder-leading Bombers got off to a fast start by booting four goals in the opening term and kicked on with seven second-term majors to lead by 36 points at the main break. West Coast never really founds its groove and eventually slumped to a disappointing 63-point loss at the hands of the experienced Essendon outfit. The Eagles’ first Grand Final appearance was preceded by a barnstorming triumph over the Cats at Waverley Park. West Coast seized control of the game early and could have led by more than 22 points at quarter time if not for some errant kicking. Geelong showed some fight in the last quarter and got to within five points of the minor premiers at one point, but the Eagles dug deep and triumphed by 15 points. Glen Jakovich starred with 23 disposals and nine marks, while Peter Sumich reigned supreme up forward with six goals. With the home crowd on their side, the minor premiers were a scary proposition. Playing at the State’s home of cricket, West Coast proved far too strong for Melbourne, cruising to a 65-point victory on the back of the extraordinary performances of Brett Heady (15 disposals, six goals), Chris Mainwaring (29 disposals, eight marks) and Dean Kemp (25 disposals, four marks). Having bowed out in the first week of finals the previous three years, West Coast was determined to make their 2005 September charge count. After beating archrivals Sydney in the qualifying final, the Eagles played host to minor premiers Adelaide at Subiaco Oval. Little separated the teams at half-time, but West Coast found another gear in the third term to establish a 32-point buffer with a quarter to play. The Crows charged home with five final term goals, but the home side did enough to put them away and advance to the big dance. Daniel Kerr led all comers with 31 possessions, while Daniel Chick and Ashley Hansen chimed in with three goals each. Same opponent, different venue, same outcome. West Coast again went to war with Adelaide – this time at their AAMI Stadium fortress – and came away with the chocolates. The Eagles failed to fire early and let the Crows skip away to a handy lead, but they came to life in the penultimate term and got within eight points of the home team at the final change of ends. West Coast completely dominated the final term, launching 12 shots at goal to Adelaide’s four. Fortunately five found the major opening, which helped the Eagles claim a memorable come-from-behind victory. Chris Judd was immense with 29 disposals, as were Ben Cousins and Dean Cox, who both collected 27 touches and six marks. West Coast picked itself off the canvas following a disappointing 2010 campaign and, somewhat surprisingly, found their way to a preliminary final. But it was always going to be a tough task against the finals-hardened Cats, who on average boasted an advantage of 60 games and three years’ experience over the emerging Eagles. West Coast kept in touch with the home side for the first half, but the Cats pounced in the third term and blew the visitors out of the water with a seven-goals-to-two third term. The Eagles never conceded but could not muster enough to get back in the contest, going down by 48 points. Things were looking a little grim for the Eagles until the seventh minute mark of the second term, when a brilliant piece of defensive play from Brad Sheppard stopped North juggernaut Drew Petrie in his tracks. The small defender cannoned into his bigger-bodied opponent, knocked the ball loose and the Eagles shot up the other end of the field, where Josh Kennedy took a huge contested mark, played on and split the big sticks. From that point the Eagles were off and running. The Eagles took the game by the scruff of the neck in the third term and held the resilient Roos at bay for the remainder of the game to notch a memorable 25-point win. Josh Hill starred with three goals, Kennedy (20 disposals, nine marks, two goals) got through a mountain of work and backman Sharrod Wellingham was influential with 27 touches, four inside 50s and a goal to boot.